A civil war is being waged among jihadists for the soul of Islam. While all Islamist radicals may share a vision of a purified and unified ummah, or Muslim community, few agree over how to bring it about. Ultramilitant wings, such as Al Qaeda, dominate our thoughts and headlines, for they have exported their brand of terrorism to America’s shores and are carrying it into the heart of Iraq. Yet they are in the minority. Most jihadists are struggling, often against great odds and under enormous pressures, to accommodate themselves to gradual social and political change in the Arab world. 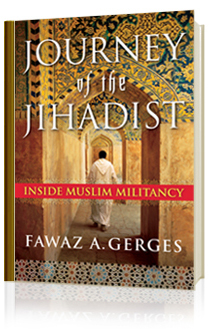 As Middle Eastern scholar and media commentator Fawaz A. Gerges reveals in this unstinting, deeply personal, and brilliantly illuminating book, we need to know now more than ever who the jihadists are and to listen to what they are saying to each other and the world. Gerges went to Cairo, the birthplace of modern Islamist radical thought, and began a dialogue with one of the movement’s founders. Using these conversations as a starting point, Gerges spoke with hundreds of other jihadists throughout the Arab world, tracing the evolution of extremist thought from the 1970s to the present—from the civil war in Lebanon, which Gerges and his family endured, to the war in Iraq that is giving Al Qaeda a new lease on life. The jihadist journey has led to bloodshed and turmoil. It did not begin on September 11 and it will not end in Baghdad. This crucially important and timely book maps the direction jihadism will take in the months and years ahead by showing where—and with whom—it all started. > Foreign Affairs named Journey of the Jihadist in their list of the top 15 best-selling hardcover books on American foreign policy and international affairs for May, June, and July 2006.